While everyone is crying foul that the iPhone is tracking users, people should be aware that their Android phone has been doing the same thing. Yes, it seems like Google's little green robot is also collecting user data every few seconds and sending it off to Google. Data which includes GPS location, Wi-Fi hotspots the phone has encountered, and the device ID. The difference between the data that Google is harvesting vs. what is going on with the iPhone is that users have to opt in for their data to be collected. During the initial phone set-up, you may have seen a message asking for which location services you would like to use. If you checked off that you wanted to use Google's location services, then your phone has been tracking you all this time. Don't worry, though; Google isn't doing anything malicious with your data. Instead, it is using the information to better target ads for things near your location. It's also so that when you do a search for "pizza," you don't get listings in New York when you are in Seattle. 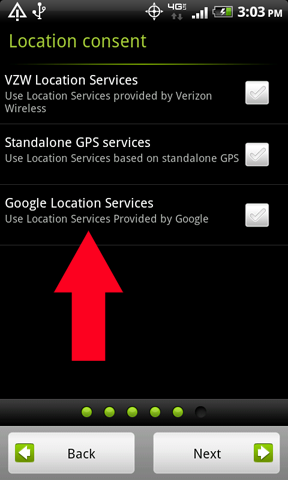 If you are still paranoid about Google keeping track of where you go, you can always opt-out by going into the settings menu and under "Location" un-checking the box next to Google's Location Services.